We offer both weathered and distressed teak products as solid flooring, engineered flooring, paneling, siding and more - in both standard and custom options. TerraMai's weathered teak products come with an authentic weathered patina created by Mother Nature, the world's ultimate product designer. TerraMai's distressed teak comes from vintage structures and is characterized by heavy surface texture, color variation, unfilled nail and other holes, checking and other signs of previous history and age. 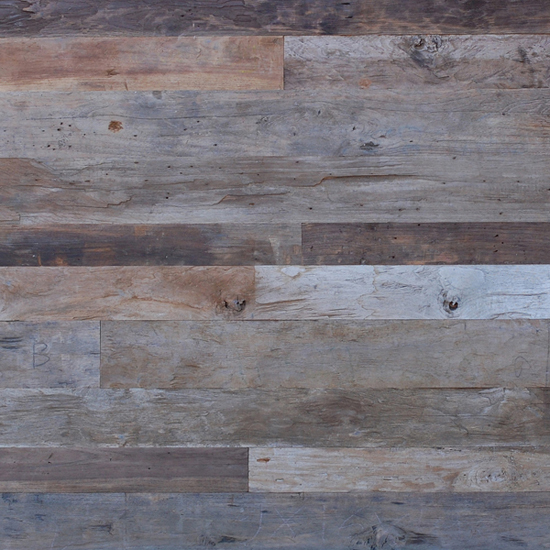 Distressed Teak, Unfinished shown here. Nail & Fastener Holes: Unlimited and unfilled. For weathered materials, holes over 6mm are prefilled. Any through holes in distressed material are prefilled. Insect Bore Holes: Unlimited and unfilled. Shake & Pith: Not allowed in flooring but allowed in paneling, siding and other applications. Decay, Wane, Warp: Not allowed. TerraMai's Select Grade Teak offers a versatile product with a variety of authentic character. Select Grade Teak includes nail and other holes and voids - all prefilled by hand with teak and/or epoxy. Select Grade Teak also includes prefilled mortise pockets, filled by hand with teak plugs and epoxy. Select Grade Teak is appropriate for a full range of applications, including paneling, siding, decking, custom flooring and more. Nail & Fastener Holes: Up to 4 cm (1 9/16") allowed. Prefilled with teak and/or epoxy. Insect Bore Holes: Unlimited. Prefilled with teak and/or epoxy. Mortise Pockets: Unlimited in size. Limited to one per 6" of length and in no more than 20% of material. Prefilled with teak and epoxy. Knots: Sound and tight only. Maximum size not to exceed half the face width of the material. No spike knots that compromise structural integrity allowed. Knot checks and voids prefilled with epoxy. Checking: Surface checks only. Unlimited in size and quantity. Prefilled with epoxy. End Splits: Only prefilled splits allowed - prefilled with epoxy. Decay, Shake, Pith, Wane, Warp: All visible surfaces to be sound material free of decay, shake, pith, wane and warp. 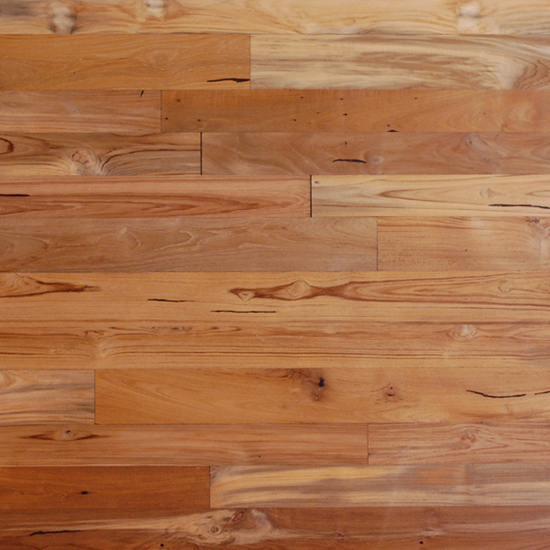 Sapwood: Limited to 25% of best face width and on no more than 20% of pieces. Limited to 25% of reverse face width. Color Variation: Unlimited naturally occurring color variation. Note: The panel shown here includes approximately the full range of character and variation found in this grade. In an actual installation, this color and character variation would be dispersed throughout an entire space. TerraMai's Premium Grade Teak offers the least amount of character. Premium Grade Teak includes prefilled nail and other holes but does not include mortise pockets. Premium Grade is also more restrictive around such things as bore holes, knots and sapwood, as detailed below. Premium Grade Teak is appropriate for a full range of applications, including flooring, paneling, siding, decking and custom products. Nail & Fastener Holes: Unlimited up to 2.5 cm wide. 2.5 cm and larger limited to four per 4' length. Maximum hole size of 4 cm (1 9/16") wide. All holes prefilled with teak and/or epoxy. Insect Bore Holes: Limited to 3/4" x 3" or to an approximate total surface area of 2 1/2 square inches. Limited in quantity to two per 6' length. Prefilled with teak and/or epoxy. Sapwood: Not allowed on best face. Limited to 25% of reverse face. 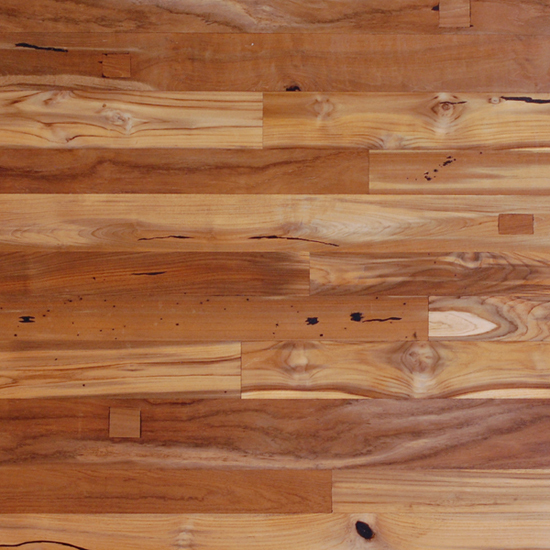 Color Variation: Unlimited in naturally occurring color variation (not including sapwood). Note: The panel shown here includes approximately the full range of character and variation found in this grade. In an actual installation, this character would be dispersed throughout an entire space.